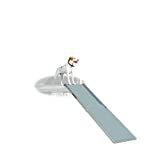 When compared to other telescoping pet ramps, the Solvit 62320 can easily be described as somewhat above average. This deluxe XL model is three inches wider and fifteen inches longer than the most popular Solvit Deluxe ramp. The purpose behind these additional dimensions is to create a “gentle climbing” angle which not only provides better traction, but also offers additional walking space for your dog. 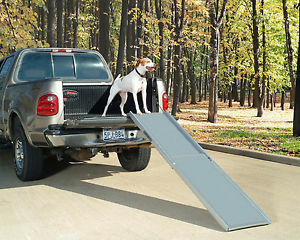 Furthermore the item’s plastic/aluminum construction makes the ramp relatively durable and lightweight, which in turn makes it an ideal item for people with large dogs and even larger pickup trucks. The 62320 offers a good combination of size, strength and light weight thanks to its aluminum and hard plastic components. The 62320 is twenty inches wide and extends between forty eight to eighty seven inches in length, depending on how it is deployed. 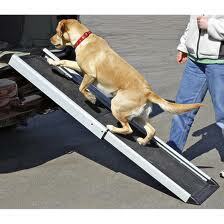 It offers a high traction surface to ensure firm footing for your dog. The item also includes a carry handle as well as a safety latch in order to prevent users from accidentally opening the ramp while it is being carried. The 62320 has a one year warranty against all types of defects. The 62320 telescopes fairly easily. The 62320 ramp can be used in beaches, camping ground and other areas. The Solvit 62320 Deluxe XL is longer than regular versions and are designed for larger vehicles and dogs. 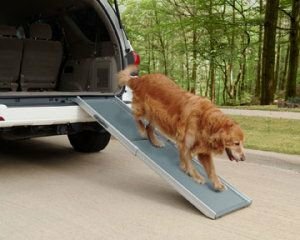 The 62320 is relatively large compared to other pet ramps, even when it is folded, which means that you may have a hard time storing it if you have a small vehicle. The 62320 has limited width and appears somewhat flimsy even though the material is quite tough. Larger dogs may have a hard time using this ramp due to its slender design. The ramp has sharp edges, which may, of course, injure your dog. When we consider all of the different characteristics of the Solvit 62320 Deluxe XL, it can best be described as a durable and useful ramp, but one that also has a lot of flaws. On the one hand, the ramp can be used on most types of vehicles and even relatively large trucks. They are also sturdy enough for even the largest dog breeds, which is useful if you like to bring your dog along with you during excursions or hunting trips. 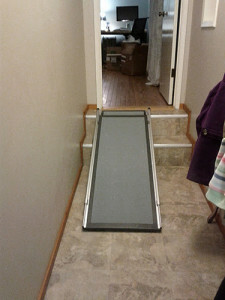 The ramp is versatile, easy to use and most people don’t have problems using it. On the other hand, it’s worth mentioning that the 62320 is not as well designed as other telescoping pet ramps. It’s a little difficult to walk on for large dogs. Likewise, if you don’t have a large truck or pickup, you will most likely have a hard time storing it. So if you do want to buy the Solvit 62320, make sure that your car is large enough to accommodate it. 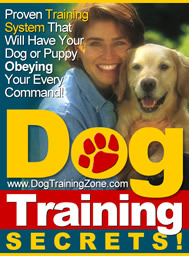 Furthermore, make sure that your dog can walk on it too.